At our three media conference we always offer pre-conference and post-conference excursions that allow attendees to engage with the local wine, beer, and food industries. At the 2018 Wine Bloggers Conference (now the Wine Media Conference), I participated in the “Explore the Heart of Washington Wine Country” put on by Visit Tri-Cities. 17 of us spent a full day visiting this area and a perfectly planned excursion. Excursions are essentially like media “fam” or familiarization tours. Like any fam tour, local organizers are tempted to pack in as much as possible, with visit after visit to local producers, restaurants, and highlights. But our conference participants much prefer a more leisurely pace that allows them to ask in-depth questions, take notes, post on social media, and truly get to know the area. Travel by bus from Walla Walla where the conference took place to the Tri-Cities area. Morning visit to the Goose Ridge Winery & Estate Vineyard. While everyone on the excursion had been to dozens if not hundreds of wineries, this visit was interesting because Goose Ridge is a large production winery that has an area focused on small batch production. We were able to see both the sides of the story, from watching trucks dump grapes into the bins to small fermentation barrels with glass tops for viewing. Timing was perfect as this was the only stop scheduled for the morning, so we had plenty of opportunity to ask questions of key staff. Lunch and tour at J. Bookwalter, which is both a winery and restaurant. 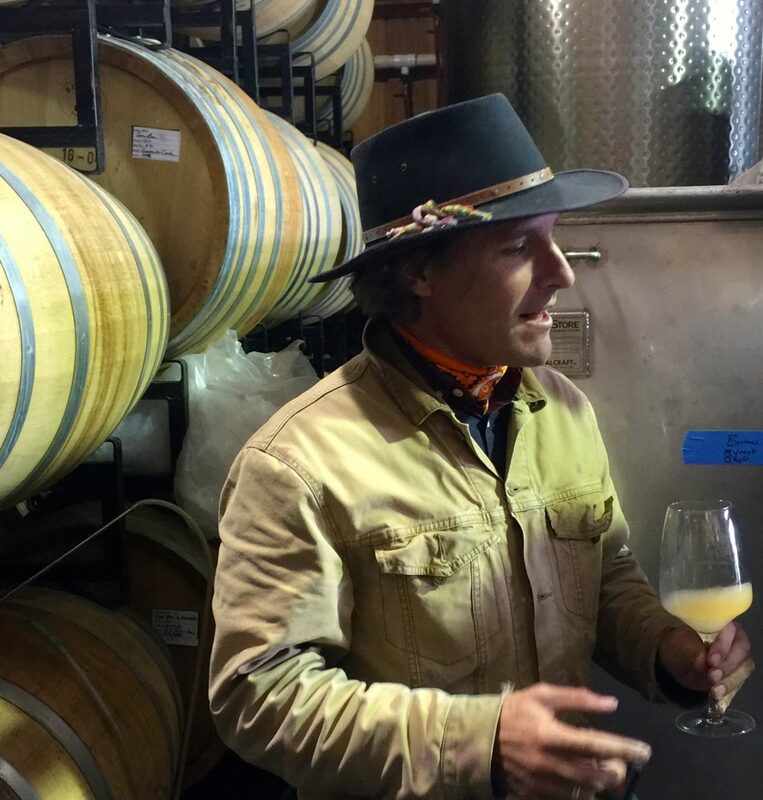 It was no coincidence that the lead winemaker, Caleb Foster, was an extremely personable and photogenic guy. Caleb spent a good hour with us, touring the facility and answering our questions. Again, this was an experienced group and so the key for us was not seeing the facility but engaging with Caleb. The restaurant staff put on an amazing meal for us, consisting of a photo-worthy buffet of small plates, each of which was identified by a small sign that called out ingredients and potential conflicts with dietary restrictions. Again in the afternoon we had only one visit scheduled, a sit-down guided, blind tasting at Terra Blanca Winery. This was a fantastic item to schedule as it engaged the attendees and educated them on Red Mountain AVA wines. The level of discussion was extremely high, as befits a group of wine media professionals. After checking into our hotel, which was courtesy of Visit Tri-Cities even though that was not part of their responsibilities, we went on a wine dinner cruise on the Columbia River. Visit Tri-Cities had invited some of its staff and board members to mingle with attendees. The CEO made a few comments but, otherwise, the cruise was a fun social event that wrapped up the day. Don’t over schedule. It is better to have a limited number of in-depth encounters. Provide access to key people, ideally those who are interesting and engaging. Account for individual eating restrictions. Communicate! We suggest emailing your list of attendees at least twice in advance of the excursion to make sure they are attending and know all the logistics. We also suggest a follow-up email immediately after and another one three to six months later. Provide photos. You don’t need to pay for a professional photographer. But it is nice to have someone there taking photos and providing access to the top 5 – 10 photos after the trip. Provide social media handles, both yours and your meal and tour providers, in advance of and during the excursion. Most importantly, remember these are professionals who know their stuff. Challenge them with advanced information and expect great questions in return.